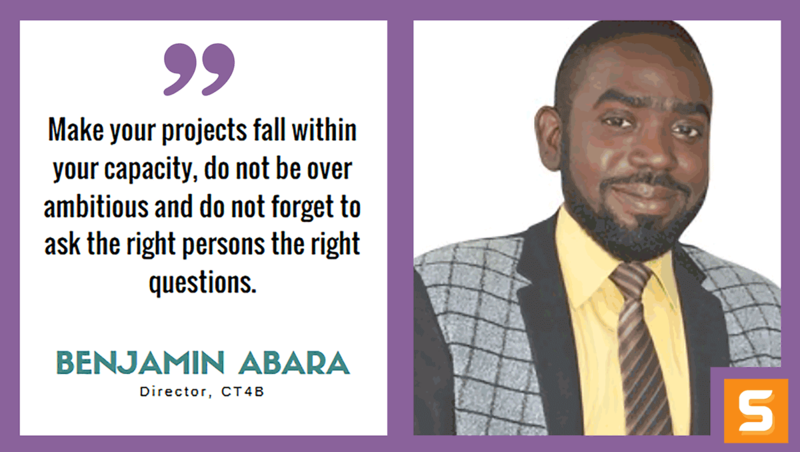 Benjamin Abara is the director of Computing Technology for Business (CT4B), an education platform focused on computing technologies and how they can be used by aspiring and existing entrepreneurs to enhance, promote and drive business for maximum productivity. CT4B also serves as an avenue for entrepreneurs of various fields to meet, learn, share ideas and also interact with established business and tech entrepreneurs. Benjamin holds a Bachelor of Science degree in Computer Science and Master of Science Degree in Information Technology. He started as the Coordinator at School of Applied Science and Technology, National Institute of Construction Technology. In this entrepreneur interview, Benjamin shares his mission to help aspiring entrepreneurs on how they improve or promote their business through computing technology. Benjamin also explains how he keeps his business running and overcoming any fear in the process. Believe absolutely in your idea, be confident in your abilities and of those you work with. Ask questions, study, improve and focus. The profits come in later. Can you tell me a little bit about CT4B? What else do you do as an entrepreneur? Computing Technology for Business (CT4B) is an education platform focused on the synergy between business and computing technology. The aim is to educate existing business owners, startups or even those considering to start business on how they can use computing technologies to promote their business. CT4B is centered on trainings, workshops, tutorials on computing technologies and how they can be used to enhance business and investments for maximum productivity and efficiency. A vast amount of computing technologies is available and most times can be overwhelming for most users, but knowing the right technology to use, when and how to use them is where we come in. Business is much easier with computing technologies. As an entrepreneur, I am into business and IT consulting, business development and graphic design. I worked with a group of people to develop an introduction to web design and development course. We noticed some of the students did not continue because they found web development difficult. This is something I can relate to personally because I also struggled for a long time to learn web and software development basics. So I thought we can reach a larger scale of people of the same category that wanted to learn technology to promote their business but did not want to go in-depth because they did not have time or patience to do so or simply did not know how powerful these technologies are. So basically, the idea came from a problem we noticed when educating people. So we decided to come up with CT4B to enable people understand and embrace technologies with ease, and to tell people who are not very interested in development that they can use tech without knowing a “whole lot” and promote their business while at it. Most businesses evolve over time. Is there a way that you slowly evolved the mission of CT4B to serve your customers better? CT4B is only a portion of a bigger vision. We intend CT4B to include trainings and conferences on every aspect of business and technology, the beauty of the technological products and how they can be used to simplify and promote better business. Well, since CT4B everyday has pretty much become a routine; studying business plans, looking at new techs in business, improving our core skills. More or less, to make a mark with what we do, we have to be good at what we do with a different and unique approach. If you want this to be longer, what is the different and unique approach? Early validation, we did not ask potential students what they wanted, we basically decided for them. Many of them struggled with some of web development courses. But now, we know most of them were looking for the easy way out and that is what gave birth to CT4B. A very good friend and colleague always tells me, “the best time to make mistake is now” and “we can’t know until we try”. He calls it an adventure. One of my motivation was when He told me “I’m willing to go on this adventure with you”. When I met my team, they all were interested. Then I realized that if I start this journey with them, a great portion of their future rests with me and for that reason, I cannot fail, we cannot fail. So even when I get scared or worried, I tell myself “I can make it work”. Yes, I did. Starting a business is not always easy. For me it wasn’t the finance, it was fear of failing and the fear of starting projects I could not see the end. I like to be in control of every turn and possible conditions in completing a project. If I cannot figure out the end from the beginning, I would not start. You can call it the fear of risk taking. In business, failure is not an option but you must be willing to fail to be successful. I’m not a risk taker, but if you fear to fail, you will never start anything. To overcome this, I had to believe absolutely in the idea, trust my abilities and of those that work with me and to remain that way we had to keep working hard. I have been quite good at management. I cannot tell where that came from, but it isn't really easy with so many expectations, involvements, tasks and limited resources. But always work according to your capability and capacity. Make your projects fall within your capacity, do not be over ambitious and do not forget to ask the right persons the right questions. The books I would recommend from the top of my head are "The Psychology of Persuasion" by Kevin Hogan, "The Richest Man in Babylon" by George S. Clason, and "iLeadership: The Steve Jobs Way of Thinking" by Jay Elliot. Where do you see CT4B in the next 5 years? Any new products in development? In the next 5 years, we intend to keep holding annual Conferences, inviting seasoned business and technological entrepreneurs from different countries to speak. We also look forward to expand our training base to countries in Africa and also have clubs in schools and colleges. What are the top 3 pieces of advice that you would give someone starting a business in Utah and the rest of the world? What do they need to know from the beginning? Believe absolutely in your idea and make your initial business plan concise, simple and achievable. Be confident in your abilities and of those you work with. Ask questions, study, improve and focus on rendering quality products and services. The profits come in later. If you want advise on how to go on with your startup using the right technology, give Benjamin a nudge on Facebook, Twitter or visit his website.